5'9", Dark complexion, brown eyes, dark hair. Wounded at Anzac Cove. Died of gunshot wounds to the head. On Memorial wall, Timaru; Timaru Boys High School War Memorial (Library); Waimataitai School War Memorial? Geoffery Fraser was the son of Charlton S and Mary Anne (Minnie) Fraser of Selwyn Street,Timaru, New Zealand. His brother Douglas also fell during the war. Geoffrey's siblings were Hansome Home (b.1881), Elmira Lucy (b.1883), Winifred (b.1884), Eric John Freeland (b.1886), Doris Mary (b.1888), Douglas Playfair (b.1889), Eva Beryl (b.1892), and Gordon Lovat (b. 1893). "CORPORAL G. E. FRASER. Mr C. S. Fraser, of Timaru, has received a private cable message from Malta that his son, Geoffrey Earle Fraser (Wellington Mounted Regiment), who was wounded on August l0th, died on Saturday in hospital at Malta. The cable message was sent by a younger brother, who was also in hospital, having been wounded a second time. The deceased soldier was about 25 years of age. 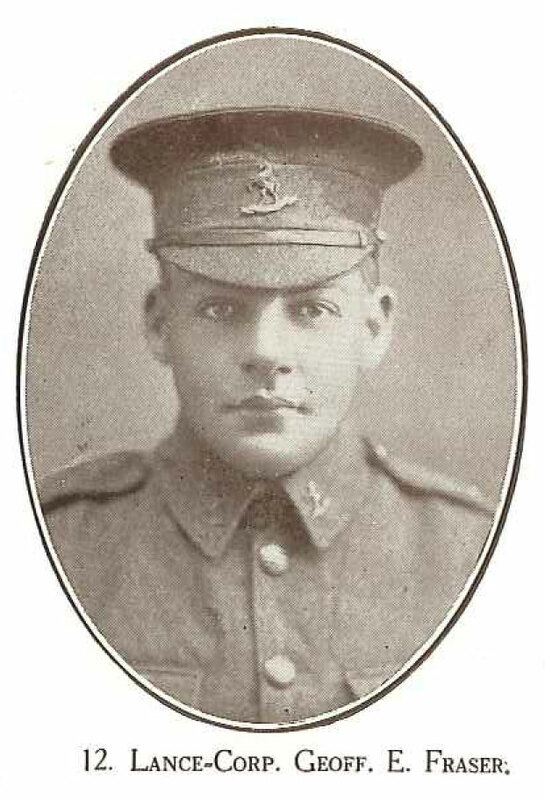 He was educated in Timaru, and went sheep-farming in the Gisborne district, and enlisted there as a trooper. He was promoted to be corporal on the field."